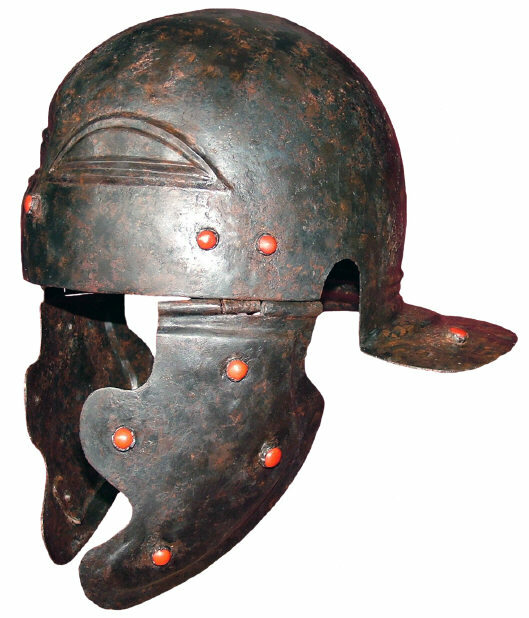 I just thought I should bring your attention to a probably not very well known Roman helmet, which is currently held at the Opocno castle in the Czech republic. The helmet is part of a collection of old weapons, which was assembled by the Colloredo-Mansfeld family (previous long-time owners of the castle). The helmet was allegedly bought in 1927 in Vienna from the estate of the fabricant and collector Josef Salzer. Nothing more is known about the helmet's origin. It is the Weisenau or Imperial Gallic C type. The eyebrows are a bit atypical, but similar can be seen on this helmet in private collection (previously displayed in Carnuntum), this helmet again in private collection (previously in Axel Guttmann's collection), and on this helmet found in Klakar, which is now in the Archaeological museum in Zagreb. The cheek guards also look quite atypical to me, but I'm far from being an expert, so if you have already seen similar cheek guards, I would be grateful for more info. According to the castle staff the two rivets above the left cheek guard are later additions, but those above the the right cheek guard seem to be authentic. Pictures of the Opocno helmet are below. 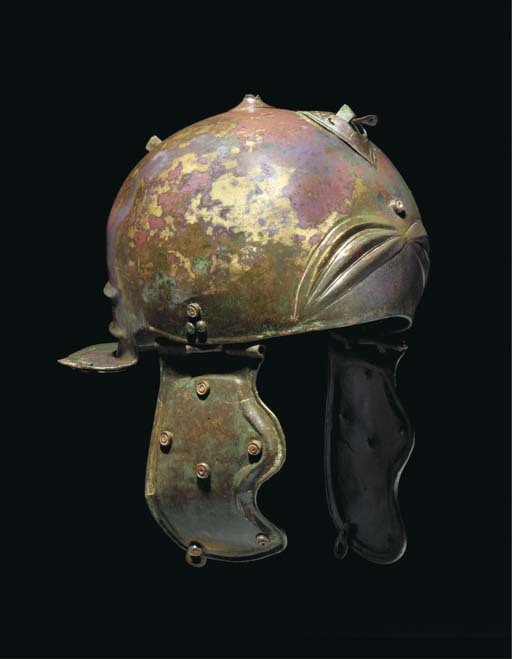 Quote: The eyebrows are a bit atypical, but similar can be seen on this helmet in private collection (previously displayed in Carnuntum), this helmet again in private collection (previously in Axel Guttmann's collection), and on this helmet found in Klakar, which is now in the Archaeological museum in Zagreb. 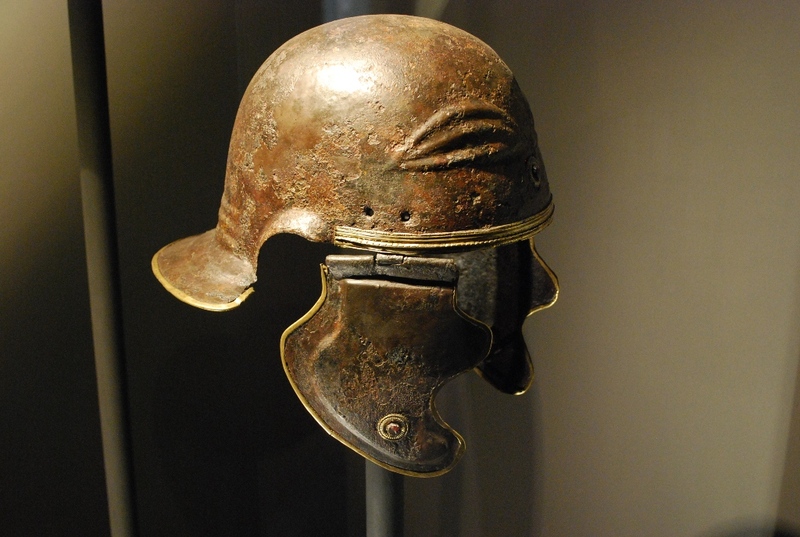 As well as these Late Roman Intercisa-type helmets (also without a brow or nose guard). Maybe another missing step in the evolution towards the ridge helmet? What do these date to, 3rd century? Quote: Maybe another missing step in the evolution towards the ridge helmet? What do these date to, 3rd century? I think this is rather early principate helmet as are those other examples with eyebrows,dated to earlier principate times or am I mistaken? Thank you and laudes to Alexandr. This is certainly the helmet from the Gimbel private collection (Baden-Baden, Germany) sold at an auction by Lepke in Berlin in 1904 (Rudolph Lepke's Kunst-Auctions-Haus, Waffen- und Kunstsammlung Karl Gimbel: Baden-Baden/Ausst. 27. Mai bis 29. Mai 1904; Versteigerung: 30.Mai bis 3.Juni 1904, Lepke, Berlin 1904, Los Nr. 35, Tafel 7). I have a photo from the auction catalogue and the raised lines on the cheekpieces are quite characteristic. It is great to see color photos of this interesting helmet! Waurick believed that the reconstruction of this helmet was incorrect (Waurick, G., 1976: Die roemischen Militaerhelme von der Zeit der Republik bis ins 3. Jh. n. Chr. 237 S., Mainz, Univ., Diss., 1970). But given the fact that we today know almost a dozen similar helmets of the Weisenau-Guttmann type, I do not see any necessity to doubt its authenticity. In terms of dating, none of the Weisenau-Guttmann helmets come from a dateable context but their similarity to earlier helmets akin to the Port type and dating to the decades before and after Christ (e.g. from Kessel/Lith, Thür or from Reka) as well as other early features (such as the shallow ear-cut-outs with limited or no additional protection) are generally taken to imply an early 1st century AD date. Quote: But given the fact that we today know almost a dozen similar helmets of the Weisenau-Guttmann type, I do not see any necessity to doubt its authenticity. Jens, would you please be so kind and provide some references for the other similar "Weisenau-Guttmann" type helmets? I know only about the ones I mentioned in my first post.